Are you looking for best-performing Vanguard mutual funds and ETFs to consider investing in? If so, you came to the right place. In this post, we'll share with you our selection of high-performing Vanguard funds as ideas for your future investments. We've attempted to be comprehensive in our approach and cover all funds that have generated high returns relative to their risk levels. We'll be discussing both mutual funds and ETFs. Mutual funds are less tax-efficient than ETFs, and often require a minimum investment amount (e.g., $10K for Vanguard Admiral funds). They also allow you to trade without paying a commission. Some of them are actively managed--which may be the right strategy for you if you're trying to generate above-market-average returns. ETFs, on the other hand, trade like stocks--and in most cases, you'll have to pay a trading fee to buy them (unless you use a zero-commission brokerage account). They are also more tax efficient than mutual funds, and typically follow a certain index (so they employ a passive investment approach). Ultimately, you'll need to consider a variety of factors including your tax strategy, the amount of money available to invest, and your overall investment strategy in order to determine which option--mutual funds or ETFs--is right for you. Our rule of thumb is, mutual funds are often preferable in tax-deferred accounts (e.g., 401K), while ETFs are often more effective in taxable investment accounts. But there are many exceptions to this rule. Before we share with you our choice of top Vanguard funds, we want you to be aware of our methodology. Our filter screens for funds with high assets, high risk-adjusted returns relative to benchmarks, and low costs. We've included both active and passive funds, but have only looked at funds that have substantial net assets, typically above $10 billion. Our logic is that as a retail investor, you should focus on those funds that are established in the marketplace. You can leave small-net-asset funds to institutional investors. Here is our selection of top Vanguard mutual funds. This choice is not meant to be comprehensive--it just represents a logical starting point for someone looking to buy Vanguard mutual funds. VFIAX seeks to track the performance of its benchmark index, the S&P 500. It employs an indexing investment approach. The Fund attempts to replicate the target index by investing all of its assets in the stocks that make up the Index with the same approximate weightings as the Index. VFIAX expense ratio is 0.04%. VTSAX seeks to track the performance of a benchmark index that measures the investment return of the overall stock market. It employs a "passive management" approach designed to track the performance of the CRSP US Total Market Index. VTSAX expense ratio is 0.04%. VINIX seeks to match the investment performance of the Standard & Poor's 500 Composite Stock Price Index. It's similar to VFIAX, but the cost is lower and minimum investment amount is higher ($5 Million). VINIX expense ratio is 0.04%. VSMPX seeks to track the performance of a benchmark index that measures the investment return of the overall stock market. It employs a "passive management" approach designed to track the performance of the CRSP US Total Market Index. It's similar to VTIAX, but it requires a $100M minimum investment, and has an ultra-low expense ratio (0.02%). Check with your investment advisor to see whether this fund is available for you to purchase. VSMPX expense ratio is 0.02%. VIIIX seeks to match the investment performance of the Standard & Poor's 500 Composite Stock Price Index. Per Vanguard, the minimum investment requirement for this fund is $100 million. It has an ultra-low expense ratio (0.02%). Check with your money manager or investment advisor whether this fund is available for you to purchase. VIIIX expense ratio is 0.02%. VITSX seeks to track the performance of a benchmark index that measures the investment return of the overall stock market. Similarly to VTIAX, it employs a "passive management" approach designed to track the performance of the CRSP US Total Market Index. Its minimum investment amount is $5 million. VITSX expense ratio is 0.03%. VPMAX is an active US large-cap fund. It seeks long-term growth of capital by investing in common stocks which are chosen on the basis of greater than average earnings, growth potential, and quality of management. VPMAX expense ratio is 0.32%. 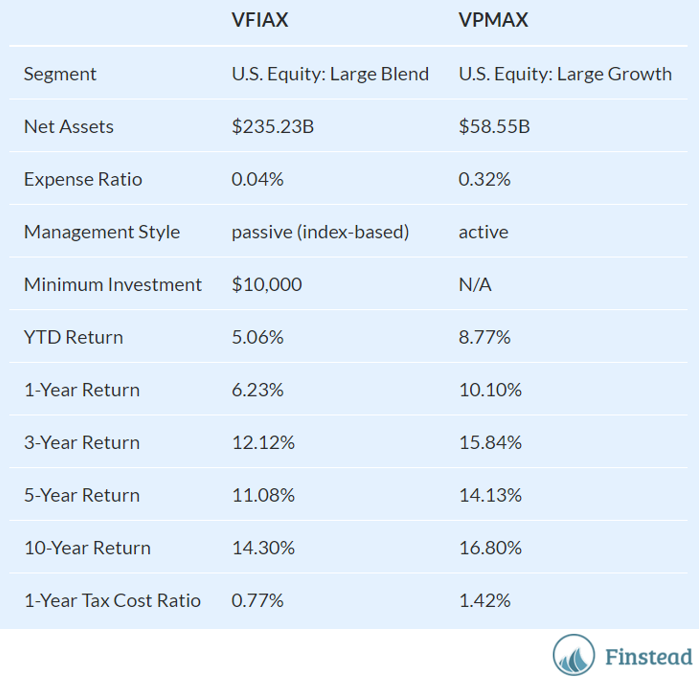 Below is a comparison between VPMAX and an index fund VFIAX. As you can see, VPMAX has historically generated higher returns than VFIAX. VGTSX seeks to track the performance of the FTSE Global All Cap ex US Index, a free-float-adjusted market capitalization weighted index designed to measure equity market performance of companies located in developed and emerging markets, excluding the United States. VGTSX expense ratio is 0.17%. VTPSX seeks to track the performance of the FTSE Global All Cap ex US Index, a free-float-adjusted market capitalization weighted index designed to measure equity market performance of companies located in developed and emerging markets, excluding the United States. VTPSX expense ratio is 0.07%. The minimum investment for this fund is $100 million; find out if you have access to it through your retirement plan provider or money manager. VTIAX seeks to track the performance of the FTSE Global All Cap ex US Index, a free-float-adjusted market capitalization weighted index designed to measure equity market performance of companies located in developed and emerging markets, excluding the United States. VTIAX expense ratio is 0.11%. The minimum investment for this fund is $3 million. VTSNX seeks to track the performance of the FTSE Global All Cap ex US Index, a free-float-adjusted market capitalization weighted index designed to measure equity market performance of companies located in developed and emerging markets, excluding the United States. VTSNX expense ratio is 0.09%. The minimum investment for this fund is $5 million. 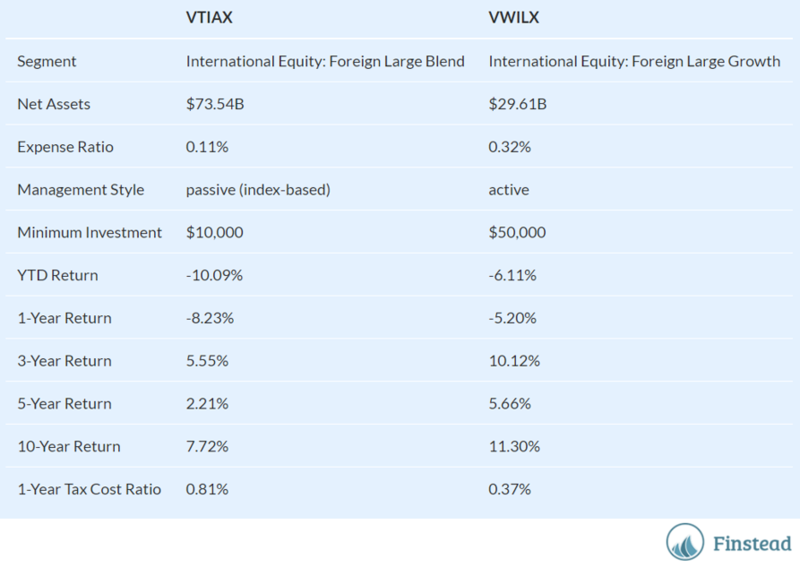 VWILX is an active international mutual fund. It seeks long-term capital appreciation by investing in equity securities of companies based outside the United States. In selecting stocks, the Fund's advisor evaluates foreign markets around the world and chooses companies with above-average growth potential. VWILX expense ratio is 0.32%. 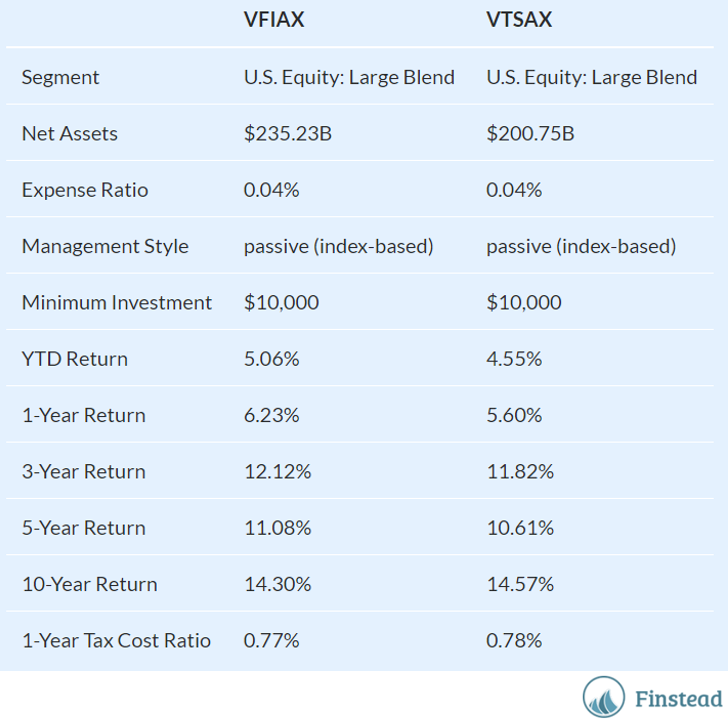 Below is the comparison between the index fund VTIAX and VWILX. You can get this by typing "VTIAX vs. VWILX" on Finstead.com. VTMGX seeks to track the performance of a benchmark index that measures the investment return of stocks issued by companies located in the major markets of Europe and the Pacific Region. The Fund employs an indexing investment approach designed to track the performance of FTSE Developed All Cap ex US Index. VTMGX expense ratio is 0.07%. 3 Samsung Electronics Co. Ltd.
Those holdings represent 10% of the fund value by assets. VEMAX seeks to track the performance of the FTSE Emerging Markets All Cap China A Inclusion Index, that measures the return of stocks issued by companies located in emerging market countries. VEMAX expense ratio is 0.14%. VEMAX gives you exposure to Brazil, Russia, India, Taiwan, and China. Some of its largest holdings are Tencent, Alibaba, and TSMC. VINEX seeks long-term capital appreciation by investing primarily in the equity securities of smaller companies (which generally have market capitalizations of $2.5 billion or less at the time of investment) located outside the United States. VINEX is a small-cap international active fund. VINEX expense ratio is 0.38%. VTBIX seeks to track the performance of the Barclays Capital U.S. Aggregate Bond Index, and will maintain a dollar-weighted average maturity consistent with that of the index. The Index measures investment-grade, taxable fixed income securities in the U.S.
VTBIX expense ratio is 0.09%. VBTLX seeks to generate returns that track the performance of the Barclays U.S. Aggregate Float Adjusted Index, and will maintain a dollar-weighted average maturity consistent with that of the index. The Index measures investment-grade, taxable fixed income securities in the U.S.
VBTLX expense ratio is 0.05%. VTBNX seeks to track the performance of the Barclays Capital U.S. Aggregate Bond Index, and will maintain a dollar-weighted average maturity consistent with that of the index. The Index measures investment-grade, taxable fixed income securities in the U.S.
VTBNX expense ratio is 0.02%. VFSUX seeks a high-level of current income and capital appreciation by investing primarily in investment-grade fixed income securities that have an average maturity of one to three years. VFSUX expense ratio is 0.1% . VBTIX seeks to generate returns that track the performance of the Barclays U.S. Aggregate Float Adjusted Index, and will maintain a dollar-weighted average maturity consistent with that of the index. The Index measures investment-grade, taxable fixed income securities in the U.S.
VBTIX expense ratio is 0.04%. VTABX seeks to track the performance of a benchmark index that measures the investment return of investment-grade bonds issued outside the United States. The Fund is designed to track the performance of the Barclays Capital Global Aggregate ex-USD Float-Adjusted Index. VTABX expense ratio is 0.11%. VFIDX seeks to provide a high level of income consistent with the maintenance of principal and liquidity by investing primarily in investment grade corporate bonds with expected average maturities of 5-10 years. VFIDX expense ratio is 0.1%. VWIUX description: the Fund seeks to provide investment in municipal debt issues with average maturities of 7 to 12 years. VWIUX expense ratio is 0.09%. VMLUX description: the Fund seeks to provide investors with a high level of current income exempt from Federal income taxes primarily through investment in high-quality municipal securities with an average maturity of 2 to 5 years. VMLUX expense ratio is 0.09%. VWSUX seeks to provide investors with a high level of current income exempt from Federal income taxes primarily through investment in high-quality municipal securities, with a maturity of 1 to 2 years. VWSUX expense ratio is 0.09%. VCADX seeks to provide a higher level of current income than shorter-term bonds by investing primarily in high-quality municipal bonds issued by California state and local governments, but with less share-price fluctuation. VCADX expense ratio is 0.09%. VWENX seeks conservation of principal, reasonable income and capital appreciation without undue risk, by investing 60% to 70% of its assets in common stocks and 30% to 40% in bonds. VWENX expense ratio is 0.17%. VWIAX seeks to provide long-term growth of income and a high and sustainable level of current income, along with moderate long-term capital appreciation. The Fund will invest 60% to 65% of its assets in investment grade fixed income securities with the remainder in dividend-paying common stocks. VWIAX expense ratio is 0.15%. VTTVX seeks capital appreciation and current income consistent with its current asset allocation. The Fund is a fund-of-funds with the asset allocation becoming more conservative over time. The allocation strategy designed is for investors planning to retire in or within a few years of 2025. VTWNX seeks capital appreciation and current income consistent with its current asset allocation. The Fund is a fund-of-funds with the asset allocation becoming more conservative over time. The allocation strategy designed is for investors planning to retire in or within a few years of 2020. VTHRX seeks capital appreciation and current income consistent with its current asset allocation. The Fund is a fund-of-funds with the asset allocation becoming more conservative over time. The allocation strategy designed is for investors planning to retire in or within a few years of 2030. VTTHX seeks capital appreciation and current income consistent with its current asset allocation. The Fund is a fund-of-funds with the asset allocation becoming more conservative over time. The allocation strategy designed is for investors planning to retire in or within a few years of 2035. VGHAX seeks capital appreciation by investing principally in the equity securities of companies in the health care industry. VGHAX expense ratio is 0.32%. VGSLX seeks to provide a high level of income and moderate long-term capital appreciation. The Fund employs an indexing investment approach designed to track the performance of the MSCI US REIT Index. The Index is composed of stocks of publicly traded equity real estate investment trusts (known as REITs). VGSLX expense ratio is 0.12%. We hope this has been a comprehensive list of Vanguard mutual funds worth considering. If you're a little overwhelmed by the amount for information you've gotten, you can always visit Finstead and compare any of those mutual funds (e.g., try "VFIAX vs. VTIAX"). Let's now switch gears to ETFs. Here is our selection of top Vanguard ETFs. There are many others worth considering, but should be a good starter list. VTI is a U.S. - Total Market ETF. Its underlying index is CRSP US Total Market Index. VIG is a U.S- Total Market ETF. Its underlying index is NASDAQ US Dividend Achievers Select Index. VOO is a U.S. Large-Cap ETF. Its underlying index is S&P 500. The Fund seeks to track the performance of its benchmark index, the S&P 500. It attempts to replicate the target index by investing all of its assets in the stocks that make up the Index with the same approximate weightings as the Index. VTV is a U.S. Large-Cap Value ETF. Its underlying index is CRSP US Large Cap Value Index. 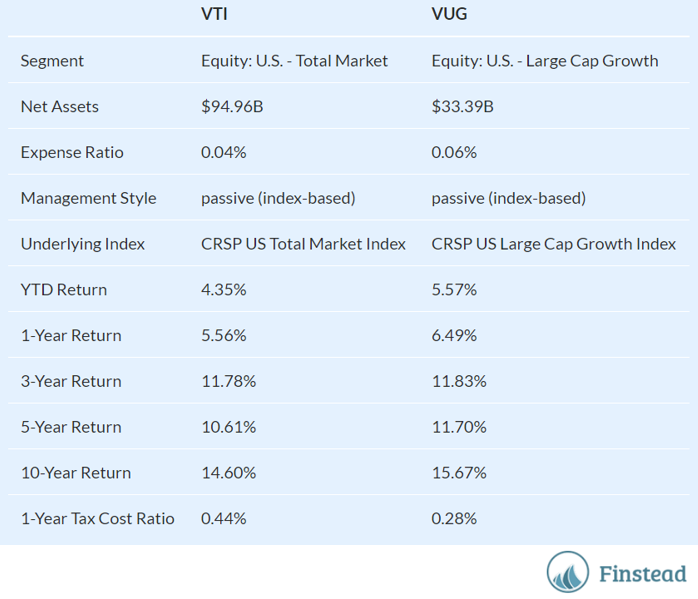 VUG is a U.S. Large-Cap Growth ETF. Its underlying index is CRSP US Large Cap Growth Index. The Fund seeks to track the performance of a benchmark index that measures the investment return of large-capitalization growth stocks. The Fund employs a "passive management"--or indexing--investment approach designed to track the performance of the CRSP US Large Cap Growth Index. VO is a U.S. Mid-Cap ETF. Its underlying index is CRSP US Mid Cap Index. VB is a U.S. Small-Cap ETF. Its underlying index is CRSP US Small Cap Index. VB seeks to track the performance of a benchmark index that measures the investment return of small-capitalization stocks. The Fund employs an indexing investment approach designed to track the performance of the CRSP US Small Cap Index, a broadly diversified index of stocks of small U.S. companies. VBR is a U.S. Small- Cap Value ETF. Its underlying index is CRSP US Small Cap Value Index. VYM is a U.S. High Dividend Yield ETF. Its underlying index is FTSE High Dividend Yield Index Net TR US RIC. VEU is a Global Ex-U.S. Total Market ETF. Its underlying index is FTSE All-World ex-U.S. Net TR US RIC. VEA is a Developed Markets Ex-U.S. - Total Market ETF. Its underlying index is FTSE Developed All Cap ex US Index Net TR US RIC. VWO is an Emerging Markets - Total Market ETF. Its underlying index is FTSE Emerging Markets All Cap China A Inclusion Index Net TR US RIC. BND is a U.S. - Broad Market Investment Grade ETF. Its underlying index is Bloomberg Barclays U.S. Aggregate Float Adjusted Index. BSV is a Government/Credit Investment Grade Short-Term ETF. Its underlying index is Bloomberg Barclays U.S. 1-5 Year Government/Credit Float Adjusted Index. VCSH is a Corporate Investment Grade Short-Term ETF. Its underlying index is Bloomberg Barclays U.S. 1-5 Year Corporate Bond Index. VCIT is a U.S. - Corporate Investment Grade Intermediate ETF. Its underlying index is Bloomberg Barclays U.S. 5-10 Year Corporate Bond Index. BIV is a Government/Credit Investment Grade Intermediate ETF. Its underlying index is Bloomberg Barclays U.S. 5-10 Year Government/Credit Float Adjusted Index. VGT is a U.S. Technology ETF. Its underlying index is MSCI US Investable Market Information Technology 25/50 Index. VNQ is a U.S. Real Estate ETF. Its underlying index is MSCI US REIT Index. As you might have noticed, most of the funds we've discussed are index funds. Recently there has been some talk around the risks of investing in index funds. In the video below, Vanguard Group Founder Jack Bogle discusses how the indexing business has changed over the years and the problem with index funds. Feedback? Questions? Send us an email at hi@finstead.com.